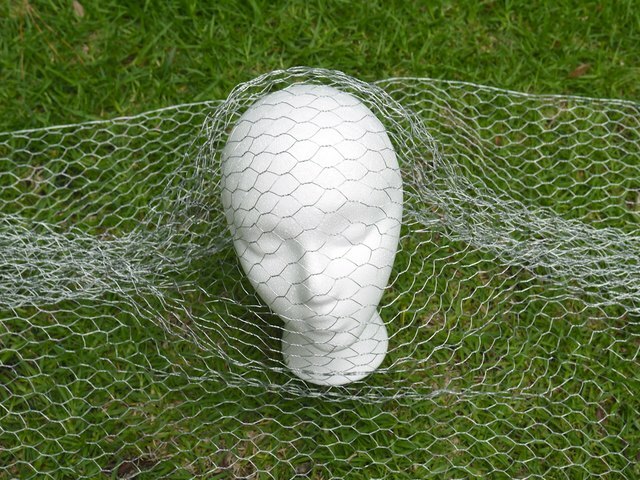 Chicken wire is the perfect medium for making a life-sized ghost to haunt your yard this Halloween. 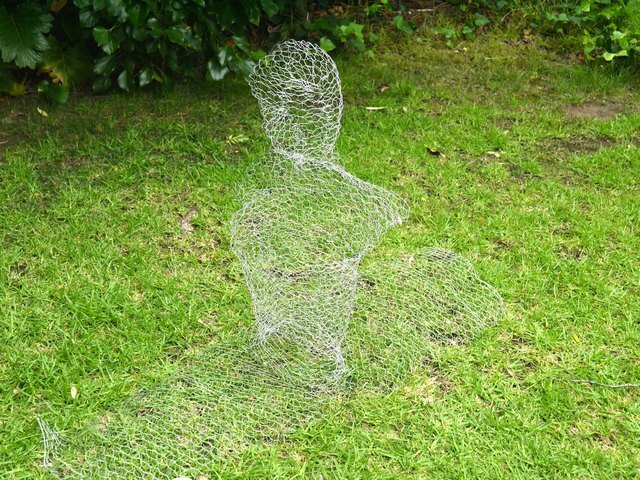 By bending the wire around different forms, you can make a human-shaped ghost appear as if it is floating across the lawn. This technique requires quite a bit of trial and error, but with a little patience and time you'll find the process easier than you think. 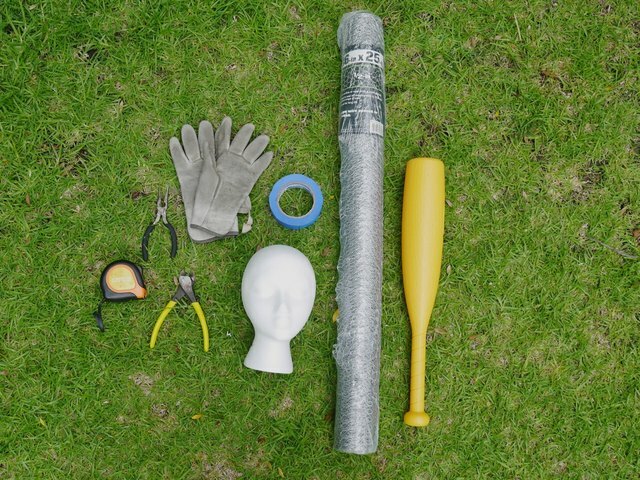 Begin this project by making the head. 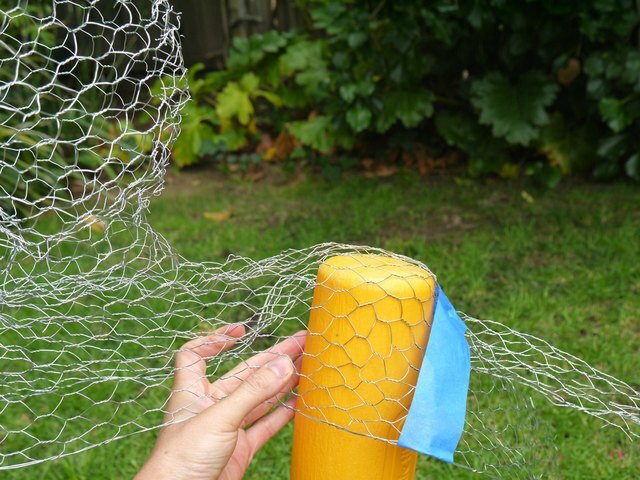 Start by opening and unraveling the chicken wire roll. When you open the package, you'll have to remove a long thin wire wrapped around the roll. Set this wire aside to use later in the project. 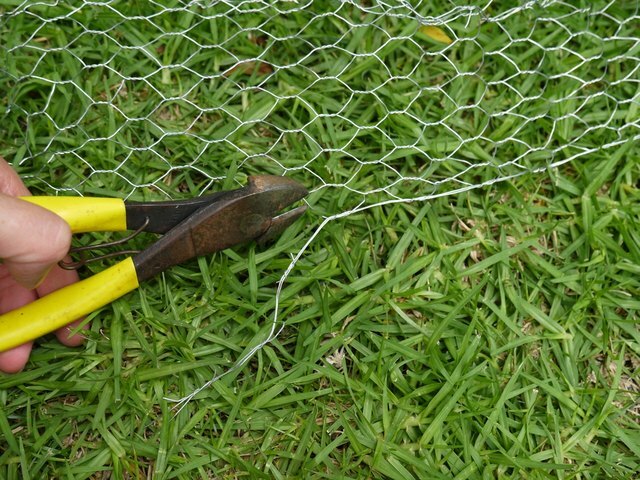 Once open, use wire clippers to clip a 36-by-36-inch square from the roll of chicken wire. Center the 36-inch square over the foam head. Bunch and pinch the wire so it gathers at the sides of the head until it is tight over the face and back of the neck. Then, shape the front and back so it fits snuggly over the chin and neck. Use wire clippers to remove the excess bunched wire from one side of the head. Clip along the outside edge of the blue tape (pictured). Note: The blue tape in the picture is to give a visual guide as to where to clip. It is not necessary to put blue tape on your form. Only clip one side before beginning the next step. 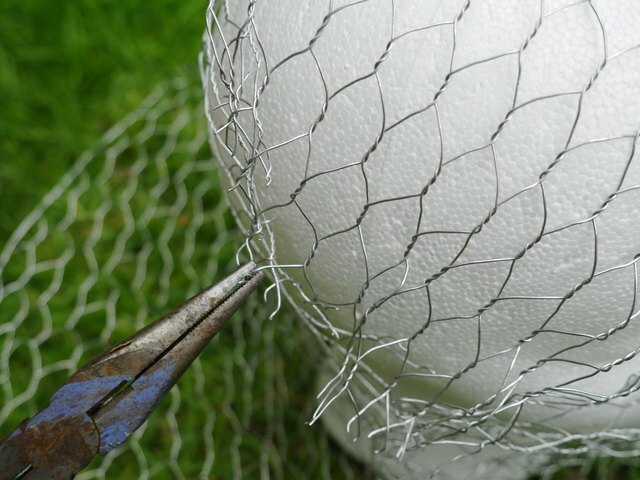 Put on leather gloves and use needle-nosed pliers to reattach the wires along the cut side of the head. Begin at the base of the neck and move up, wrapping the loose wires around the solid hexes. Keep the clippers handy in case more wire needs to be removed for a tighter fit. 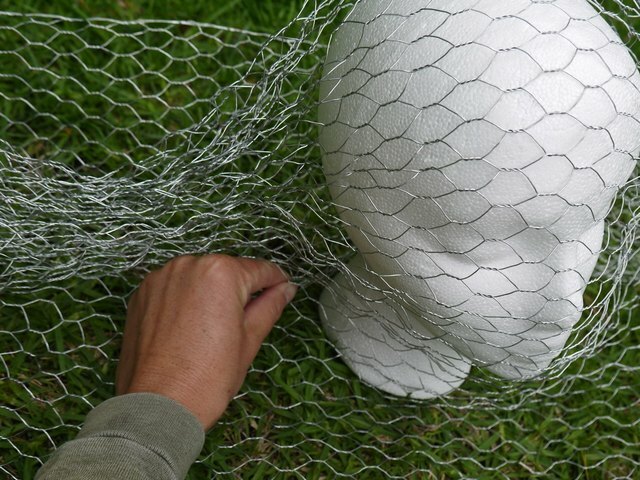 Reattach the wire all the way to the top of the head until the last wires are looped and secured. Then, reattach along the shoulders. Twist the loose ends of the hexes together with the needle-nosed pliers to make the bond. Then turn the points of the wire in, so they don't scratch you. There are many ways to attach the hexes. You can also loop two together and twist. Take some time to figure out which method works well for you. It gets easier as you go. 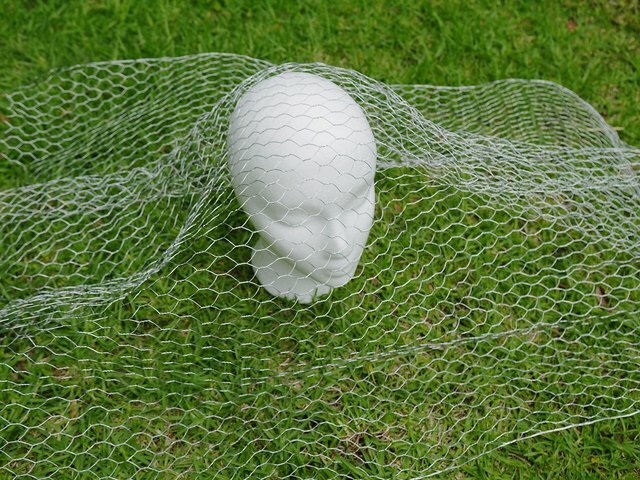 Once the entire left side is completed, remove the foam head form and clip away the excess wire on the other side of the head. Then follow the same technique as in the previous step for clinching the wires together on the right side. When completed, the head should sit up on its own. Use your thumbs to form indents in the wire for eye sockets. 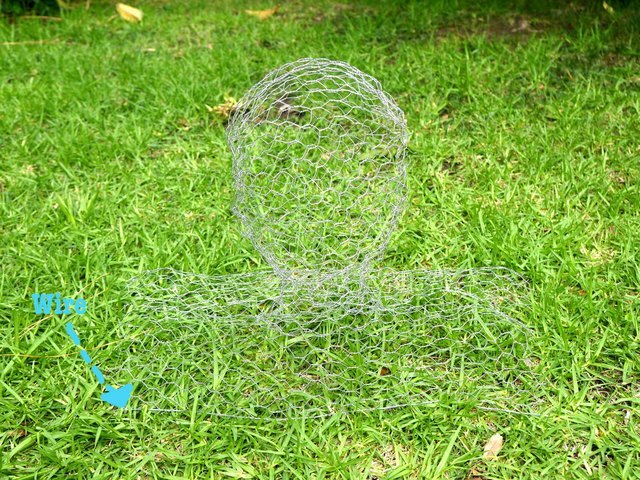 Then pinch the wire out to form a nose. Pinch the chin area so it points out from the neck. Measure 8 1/2 inches from the chin to the shoulders on both sides, 17 inches total. Use painter's tape to mark the measurement. Use the baseball bat to shape the shoulders. 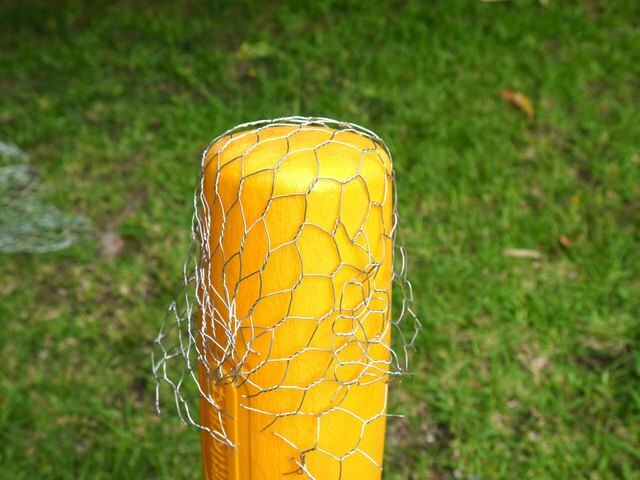 Place the bat under the chicken wire on the inside of the blue tape and mould the wire over the top of the bat. 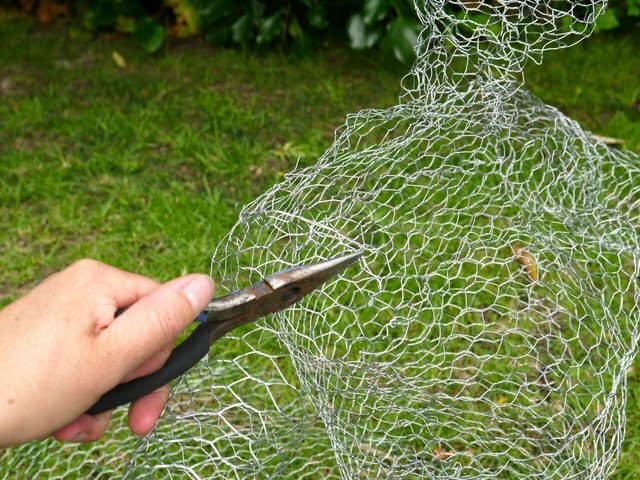 Do this to both sides and then use clippers to remove the excess chicken wire. The shoulders should be rounded, measuring 8 inches from front to back and 17 inches long from one side to the other. 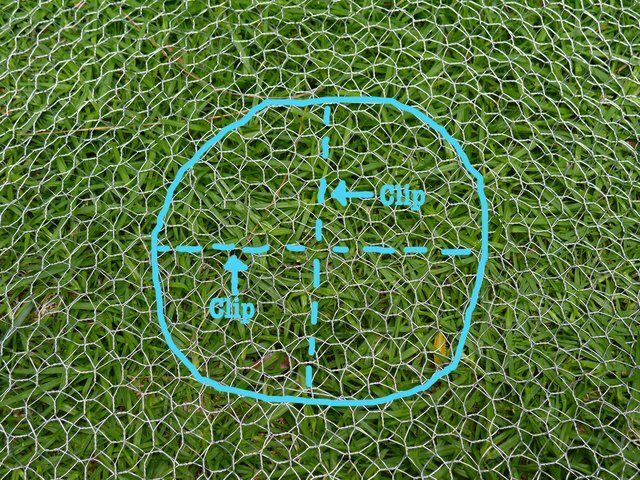 Adjust your measurements to match by clipping excess wire if needed. 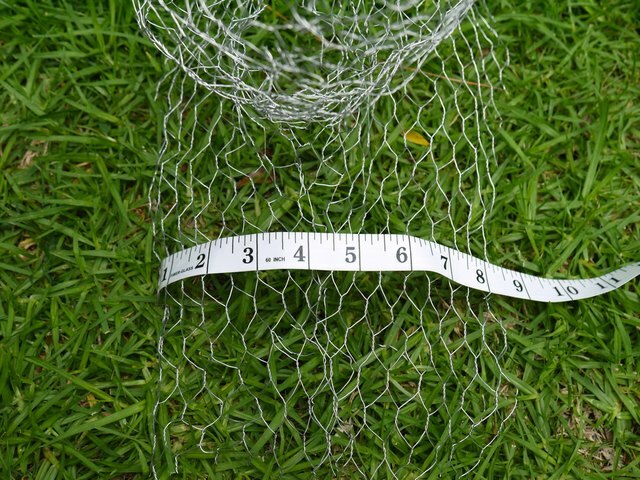 The top and bottom of the chicken wire comes with a manufactured wire through the links. You'll need to remove this wire from the front and back of the shoulders using wire clippers. 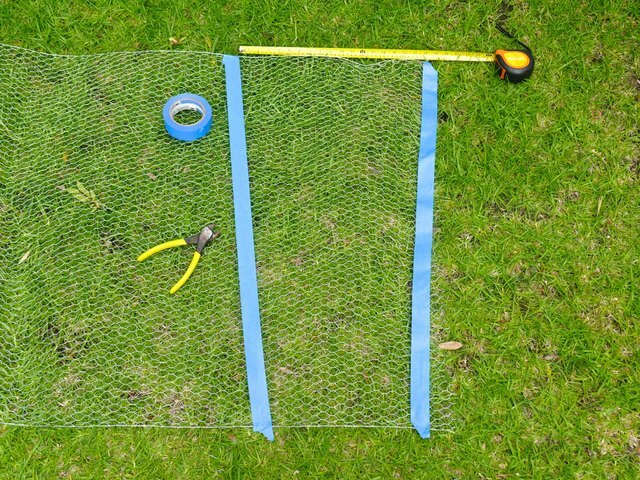 Measure 18 by 36 inches of chicken wire from the roll and lay it flat. 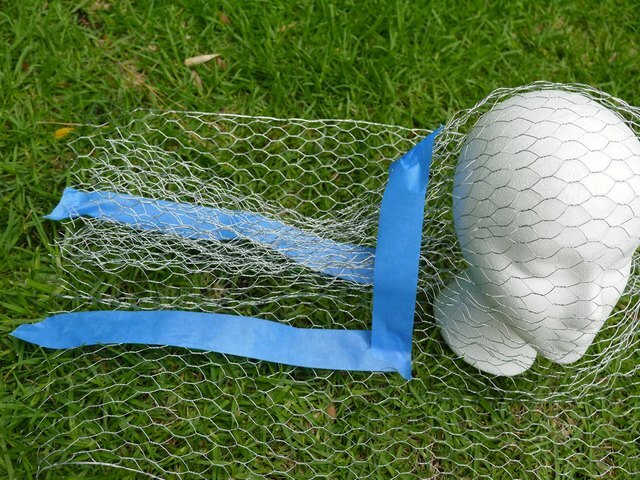 Use painter's tape to taper the sides of the wire so it measures 18 inches at the top and 13 inches at the bottom. Then clip along the edge of the tape. Repeat this process to get two pieces of the same tapered torso shape. 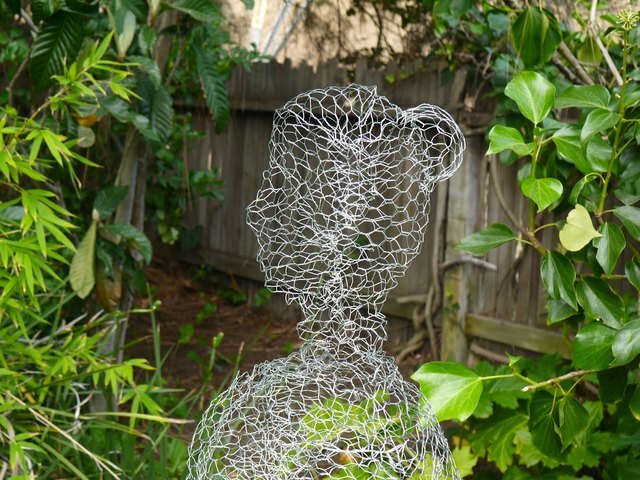 When making the second torso shape, measure 18 inches from the bottom of the wire. 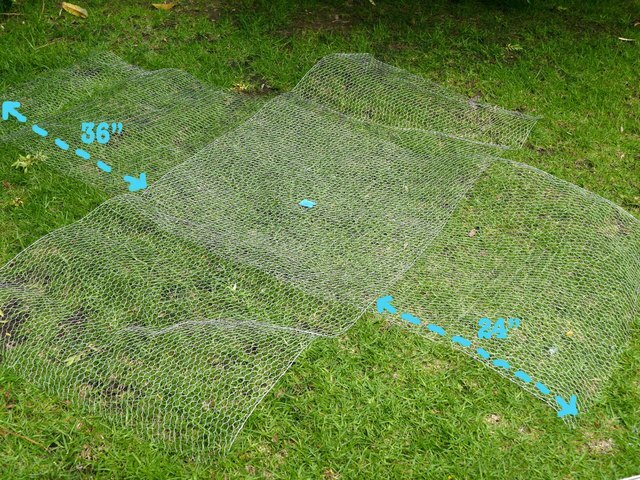 One side of the chicken wire will already be angled in from the previous cut. Measure and cut the other side only. This saves you a cutting step. Attach the first torso shape to the front of the shoulders, under the neck. Line the long side of the torso shape up with the bottom edge of the shoulders and clinch the hexes together with needle-nosed pliers. Do this to the back side of the torso as well. Then, leave 4 inches of wire open under the edge of the shoulders to make the arm holes. Connect about five links at the armpit and down towards the waist. Once five links are secure, leave the rest of the side open for future shaping. Next, measure 17 inches from the top of the shoulders to the waist and then bend the extra wire out so it is perpendicular to the torso. The form should now sit on the ground without falling over. Place the baseball bat inside the torso even with the armpits. Mould both sides of the bust around the top of the bat. 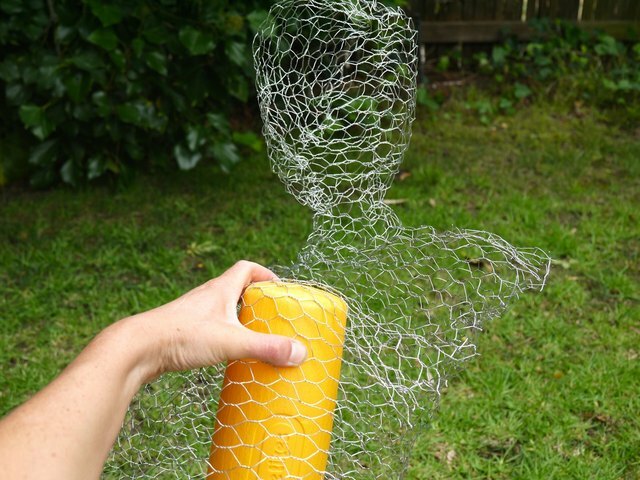 You'll also have to use your hands to sculpt the wire into the form of the bust. 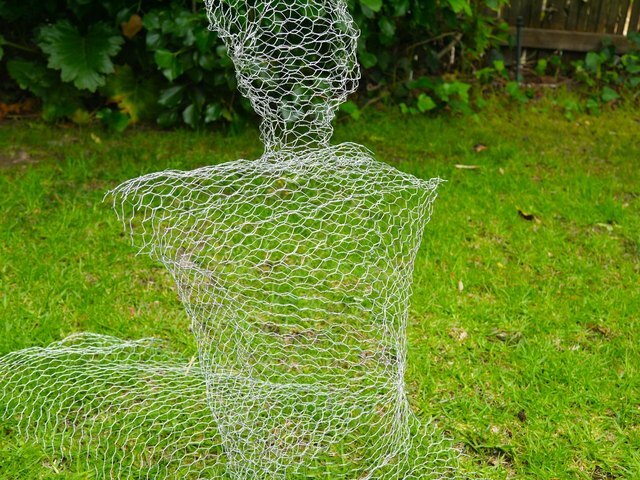 Always keep in mind the human shape when sculpting the wire. Do your best to keep the neck long and the chin up just a bit. The shoulders should sit directly over the waist. Now make the billowy dress. 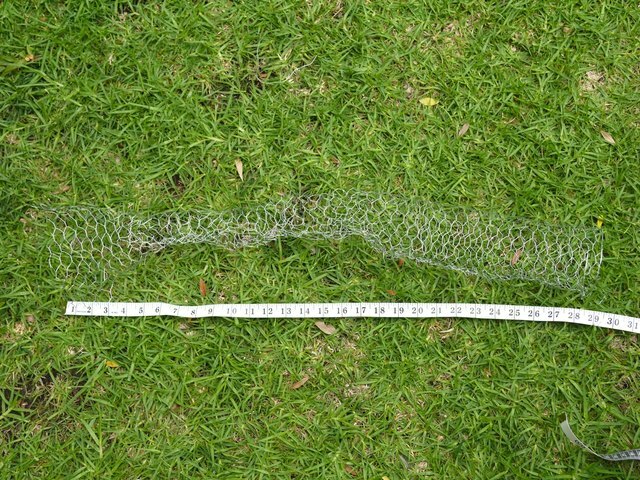 Begin by measuring and clipping 7 feet of chicken wire. Lay it flat on the ground. 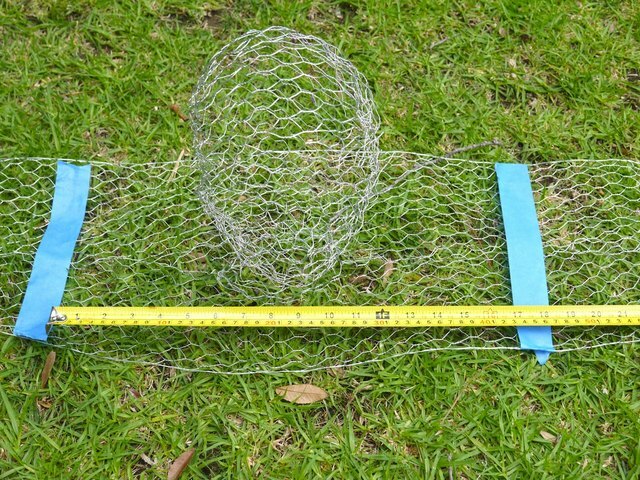 Then, measure 8 feet of wire and lay it perpendicular to the first layer so it forms an "X." Center the two pieces evenly, but let one side of the top layer be 12 inches longer than the other side. 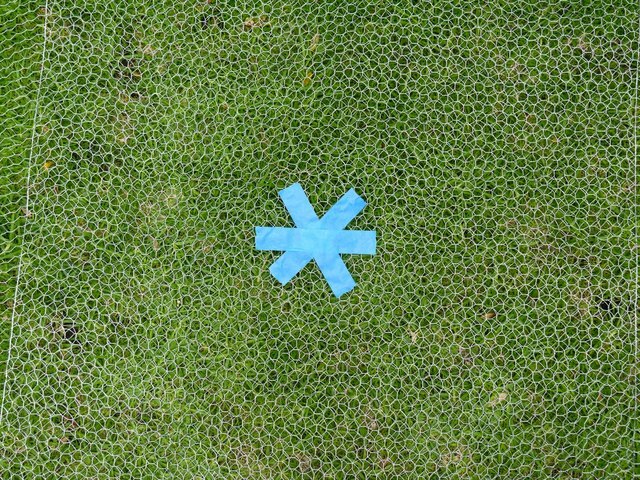 Mark the middle of the overlapping square with a piece of tape. 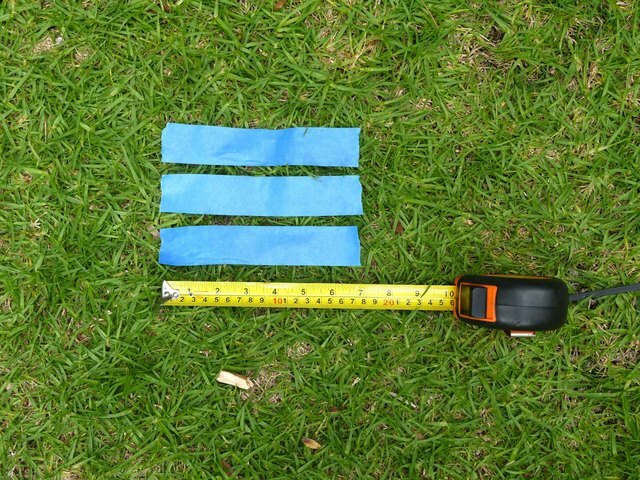 Cut three pieces of painter's tape measuring 7 inches each. Use the strips of tape to make a star at the center of the wire, where the two pieces overlap. You should already have this marked. 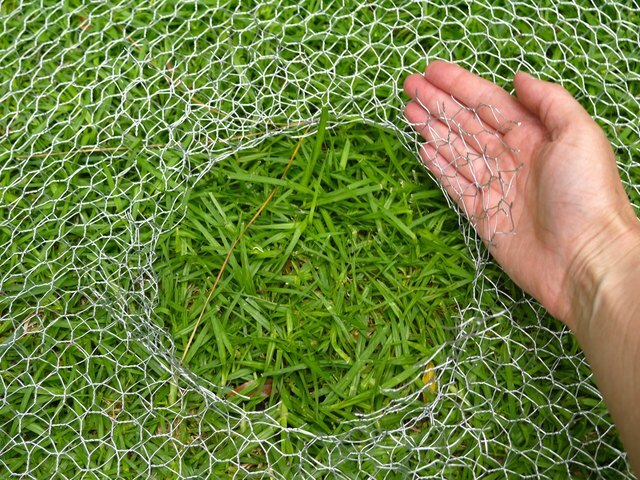 Use the long wire you set aside when opening the chicken wire package to sew a circle around the star. Clip about 14 inches from the wire and use needle-nosed pliers to weave the wire in and out of the two layers, locking them together. When you reach full circle, twist the joining ends together and clip away the excess. Remove the tape and clip across the circle you just sewed, and then across the opposite way, forming an "X." Pull the sides back so the center circle is open. 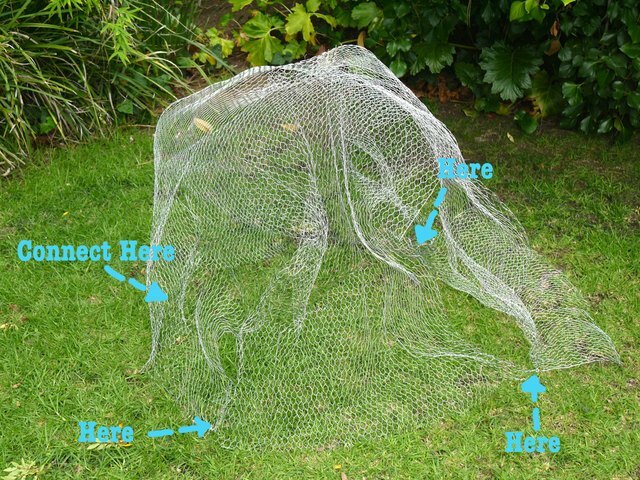 Pull the corners of the chicken wire in until they meet, and then clinch them tightly together at the four corners. Leave an extra 12 inches of wire at the back of the long side. 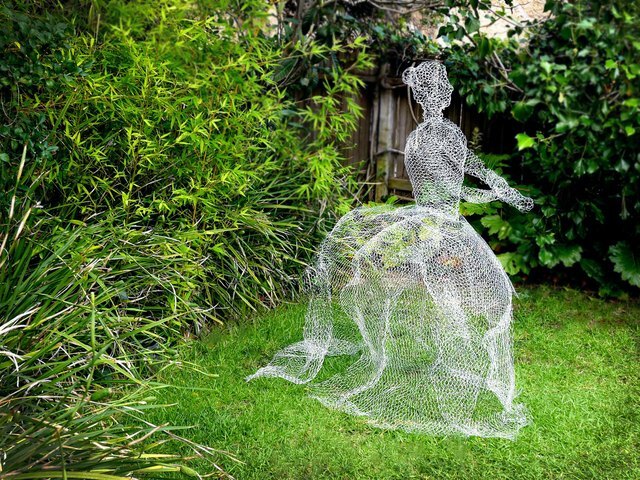 The dress will begin to form. 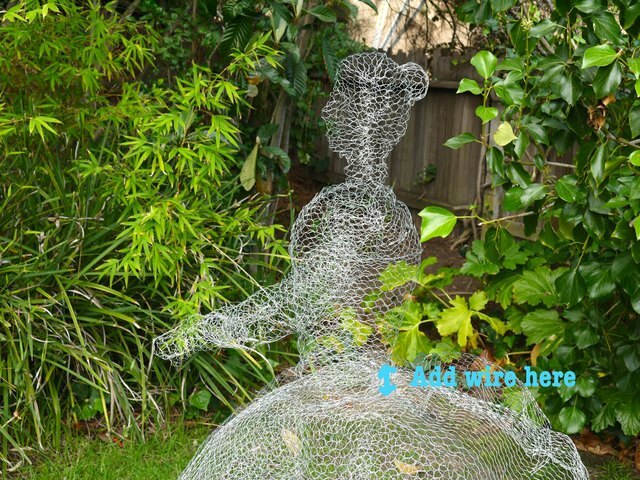 The natural bend of the chicken wire will want to turn in. Wearing gloves, force the edge out so it creates a shelf for the dress to sit on. 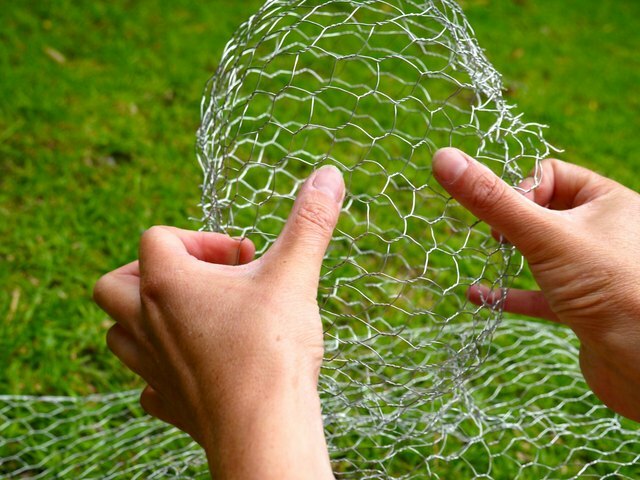 Use your hands to shape the wire until it sits up on its own. 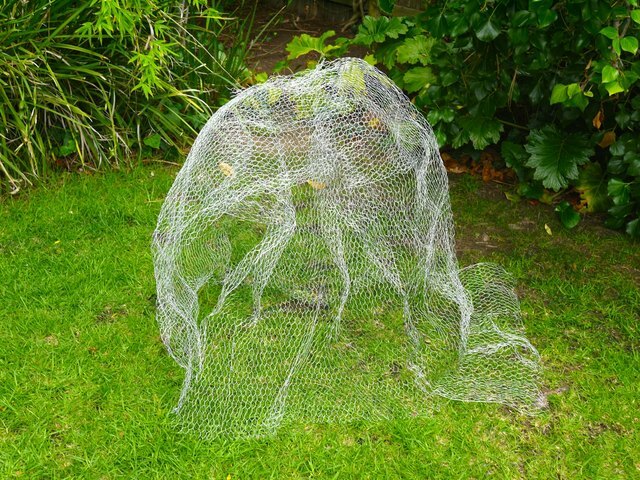 You should have just enough chicken wire left on the roll to make the two arms. 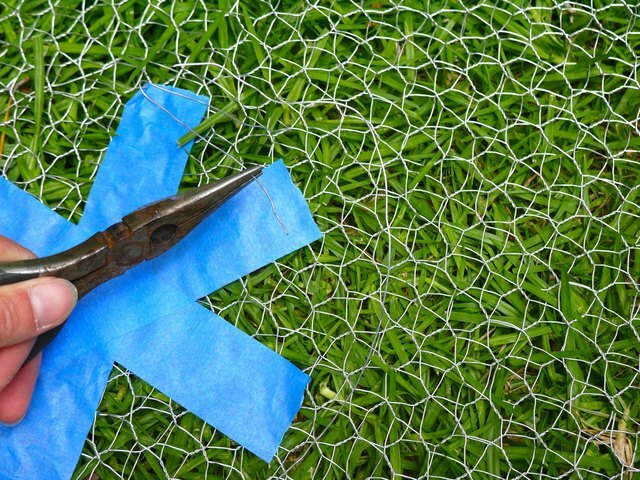 Begin by wrapping the wire around the bat and clipping away the extra. Overlap the wire until the circumference is about 11 inches. Link the hexes 12 inches down the shaft of the arm. At 12 inches, pinch the tube together to make the elbow. You can bend the wire a little to one side to make the natural bend of an arm. Continue linking the hexes down the forearm, tapering in the width of the tube as you go. When you reach 9 inches from the elbow, stop linking the hexes, and leave the last 7 inches open for the hand. The entire arm length should measure somewhere between 28 and 32 inches. Do this a second time to make a matching arm. Trim the tops of the arms at a 45-degree angle so they will attach to the torso properly. 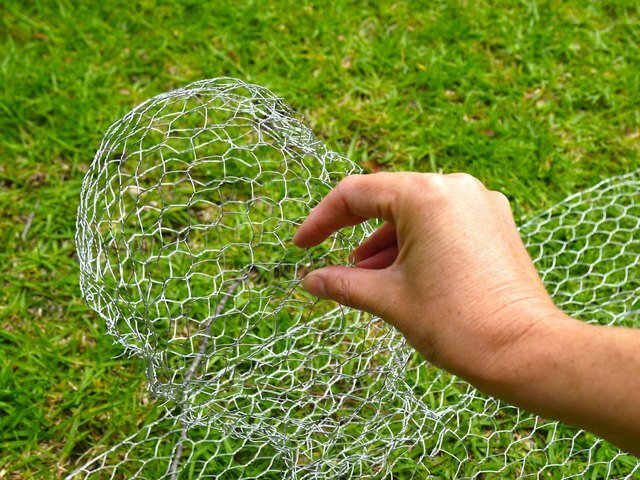 Fan out the last 7 inches of chicken wire on the arms to make the hands. Trim the sides to make the shape of a palm and fingers. You do not need to make individual fingers. Begin by linking the arm shapes to the torso with needle-nosed pliers. The arms should fit perfectly over the holes previously left on the torso. 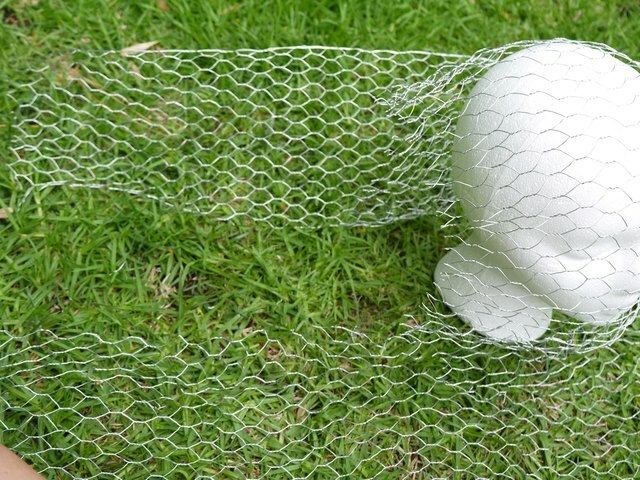 Make a bun for the head by molding a piece of chicken wire over the end of the bat and trimming it to about 3 inches tall. Then, attach it to the back of the head with the needle-nosed pliers. Finally, place the entire torso over the top of the skirt and line up the openings. Squeeze the waist in so the openings match in size -- the sides of the torso will overlap until the waist is the proper size. Then link the hexes together. This step takes some individual shaping and moulding to get the form to look lifelike. Spend some time positioning the arms and bust until you are happy with the silhouette. 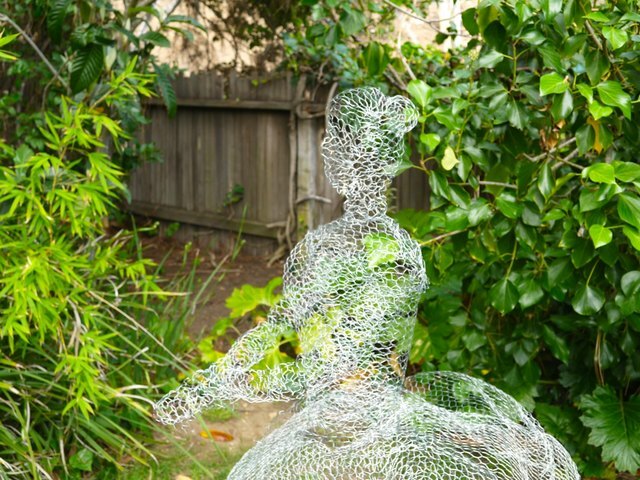 If the torso slumps forward, you can place a wire at the lower back, connecting it snugly to the skirt. This will keep your ghost upright. Continue making adjustments until you are satisfied with the shape. You can play with placing the arms in different positions. 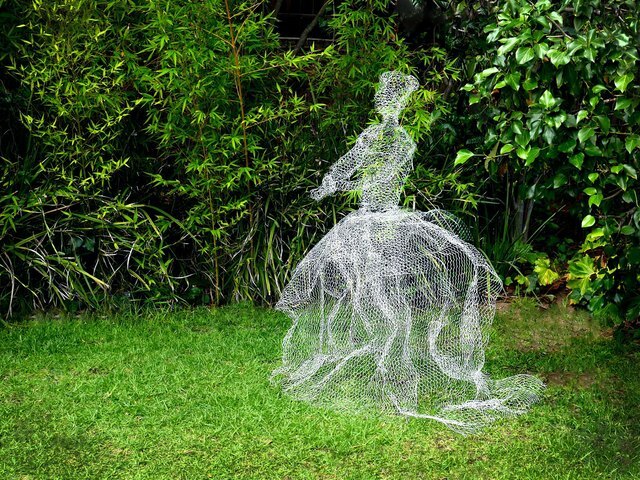 Once completed, the ghost should sit sturdily on its own and be easy to move around to haunt your yard in various locations.